Vietnam has taken part in the 32nd Korea World Travel Fair (KOTFA), which ran in Seoul, the Republic of Korea, from June 1 to 4. Vietnam was represented by a number of tourism departments and 15 travel agencies. The country’s exhibition space at the fair was decorated with traditional conical hats, ao dai (traditional long dress), monochord zithers, attracting a large number of visitors. 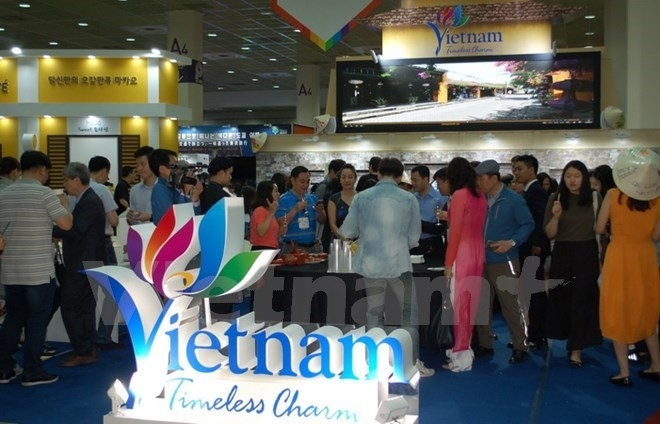 According to Dinh Ngoc Duc, head of the Tourism Market Department under the Vietnam National Administration of Tourism, Vietnam brought to the show four main tourism products in the fields of sea, eco-, cultural and city tours. He said he expects the number of Korean arrivals in Vietnam will grow 40 percent this year, which equals 2 million visitors in total. He added he believes the volume will continue to increase thanks to growing bilateral ties, favourable air routes and Vietnam’s visa waiver policy for RoK nationals. After the KOTFA, the Vietnam delegation for tourism promotion is scheduled to hold a conference in Busan, the RoK’s second biggest cities. Fifty local travel agents would take part in the event. In 2016, Vietnam welcomes 10 million foreigners, up 26 percent year on year. Of the sum, 1.55 million were from the Republic of Koreans, representing an annual increase of 37.8 percent.